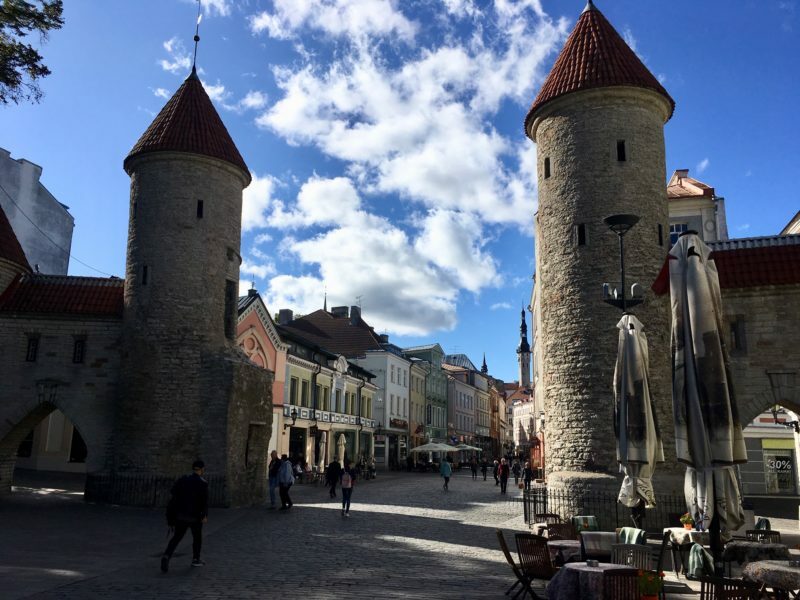 Tallinn, Estonia is just 50 miles across the Gulf of Finland from Helsinki. It shares a history with Finland, but as a Baltic country, it has many influences from Western and Eastern Europe. 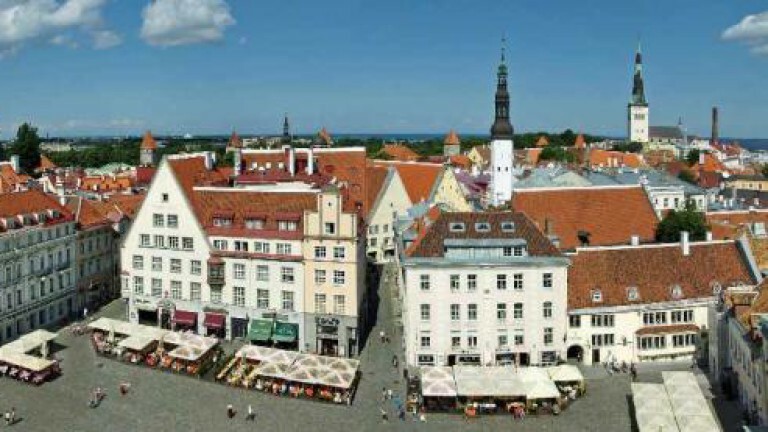 Its capital, Tallinn, has an intact medieval village that was not destroyed by the wars in Europe. We took a ferry from Helsinki and spent two days exploring the Old Town and enjoying the diverse restaurants. Tallinn was a medieval stronghold of the Baltic trading world and was influenced by the Germanic Hanseatic League who ruled the seas. Flammkuchen is a German (or Alsatian) pizza. We enjoyed strolling its cobbled streets and getting lost among the many turreted watch towers. 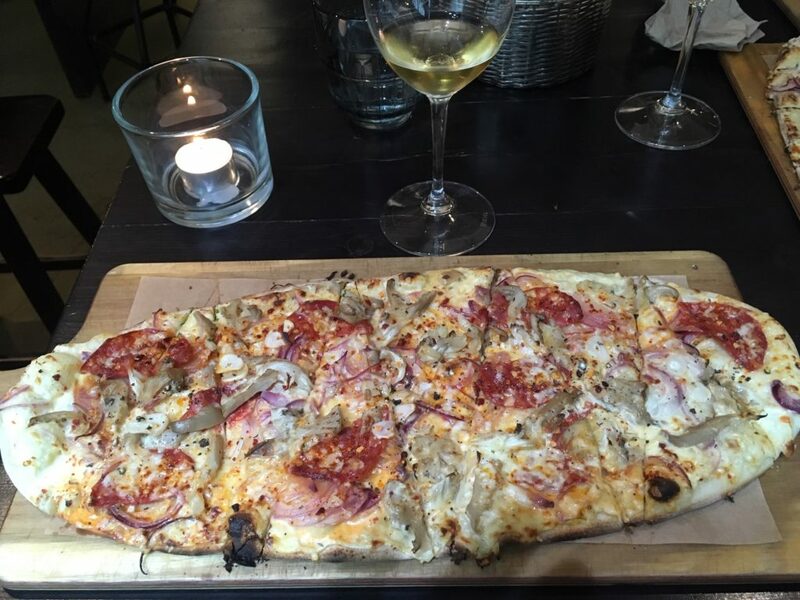 Flammkuchen Wine Bar is situated in the Old Town’s Rotermann Quarter in a former old grain elevator. 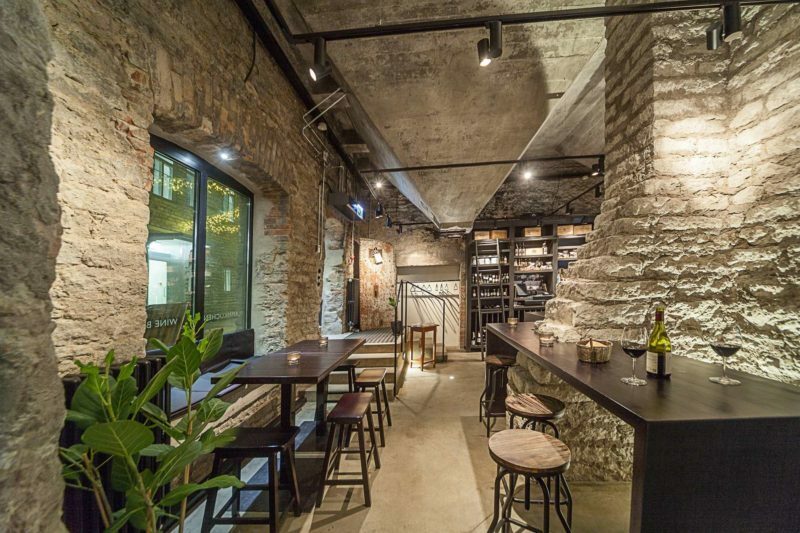 The limestone walls and grain hoppers give the interior an extraordinary atmosphere. 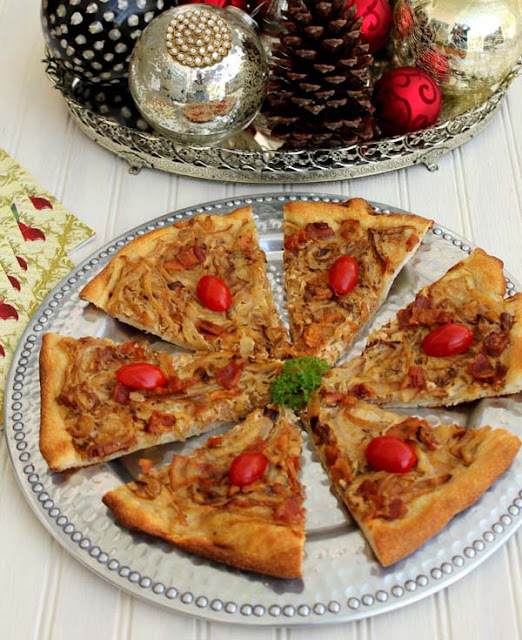 Flammkuchen pizza differs from other pizzas because the crust does not include yeast. This yields a very thin and crisp crust. 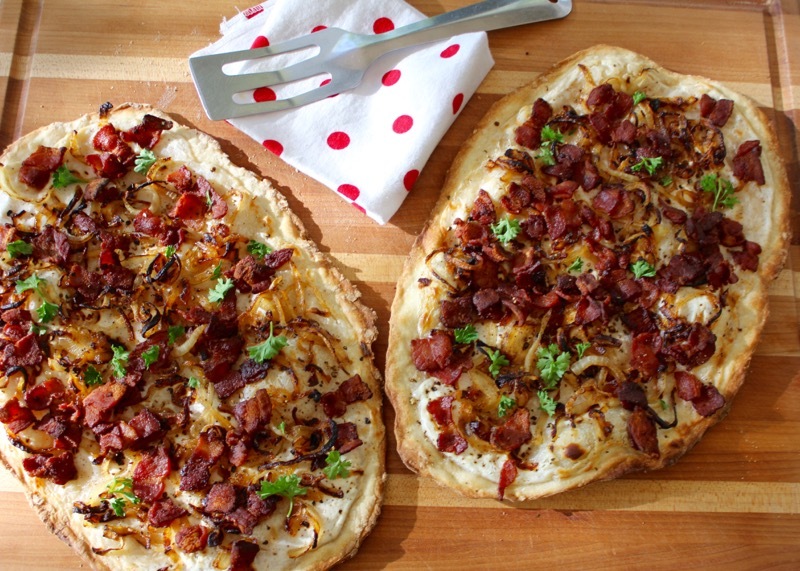 The traditional version includes creme fraiche, nutmeg, bacon and onions. It was so delicious I had to make one at home. In a large bowl, mix together flour, salt, water, and oil. Mix until a dough begins to form. Place the dough onto a lightly floured board and knead until it is soft and smooth, You may need to add a little more water. Let the dough rest under a towel. Mix together crème fraîche and nutmeg in a small bowl and set aside. In a large sauté pan, sauté bacon until it is crisp. Remove the bacon to a paper towel lined plate. Save 2 Tablespoons of bacon grease in pan. Place the sliced onions into the hot bacon grease and sauté over medium heat, stirring occasionally, until caramelized, about 10 minutes. Divide the dough into two balls and stretch the two out into rectangles, roughly 10×16 inches each. Place the two onto a large baking sheet that has been generously dusted with cornmeal. Spread the crème fraîche mixture over the crusts, leaving just a little bare crust border. 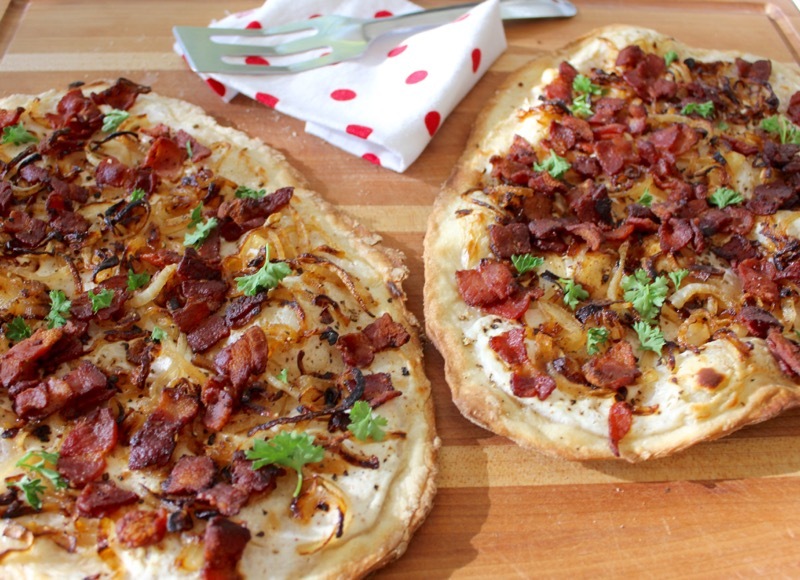 Distribute the caramelized onions over the crème fraîche, and sprinkle the bacon over the onions. Place the baking sheet with the pizzas into the oven and bake for 15-20 minutes, until the pizzas are crisp and the edges are starting to darken. Slice and serve. Posted on November 10, 2018 at 11:01 am. 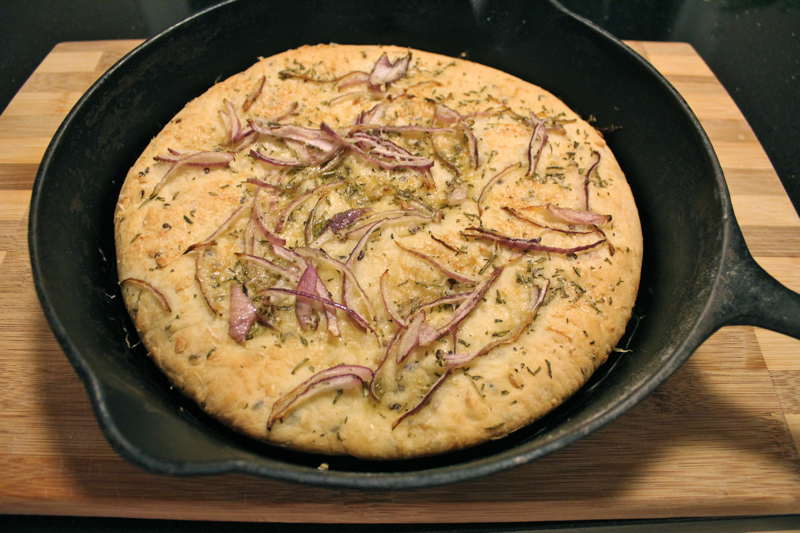 Whether you make your own pizza dough or get a store-bought round of dough, there is nothing easier than this focaccia. 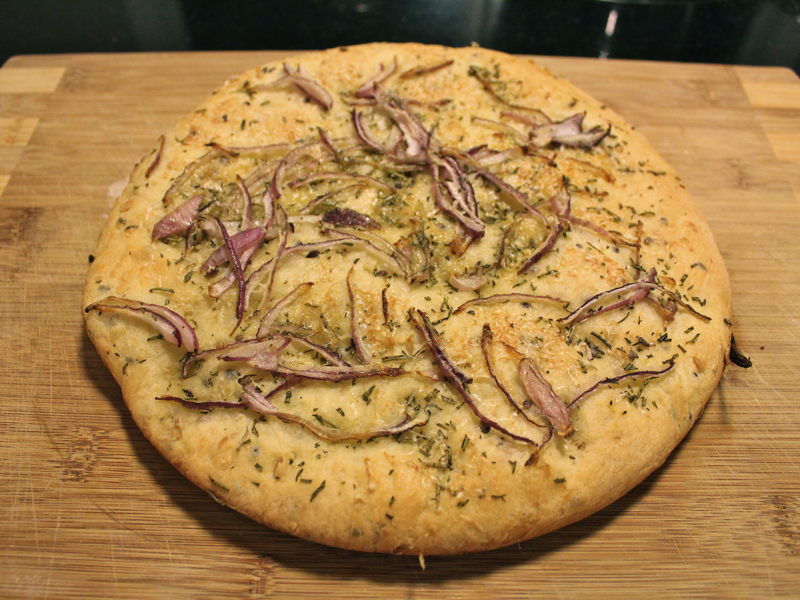 With a simple topping of red onion shards, olive oil, rosemary and Parmesan cheese, you can have a special bread on the table in no time. It is also adaptable. With ingredients like pizza sauce, mozzarella and pepperoni you could turn it into a deep-dish pizza. I bought a round of multi-grain pizza dough from Publix. The cast iron skillet is preheated in the oven before adding the dough so that it develops a nice brown crust on the bottom. We will be making this again with variations. We are in North Carolina until Saturday. A snow and ice storm is heading our way. Hopefully we will not lose power. Happy Valentine’s Day everyone. Perhaps you could serve this special bread with whatever special meal you are planning. Preheat the oven to 350 degrees F. Place a 12-inch cast-iron skillet on the center rack as it preheats. Bring the pizza dough to room temperature. Dust the counter-surface with flour. 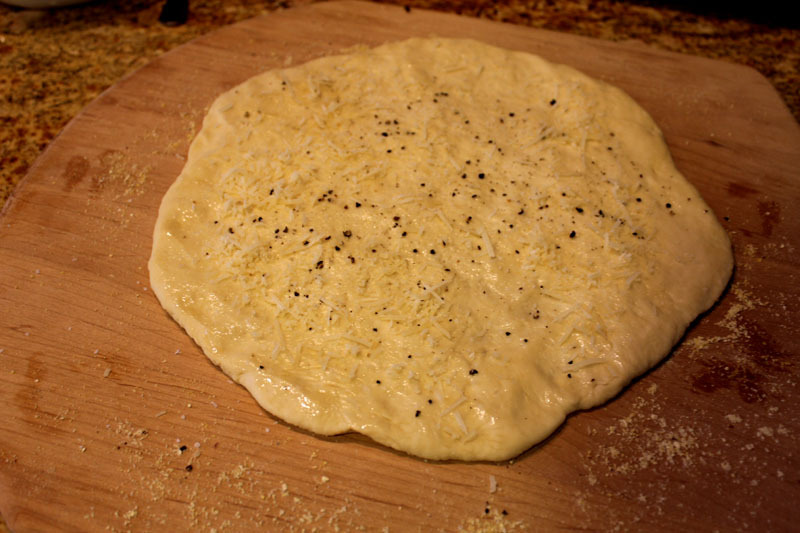 Stretch out the dough to a 12-inch circle. I rolled it with a rolling pin dipped in flour. Drizzle the hot skillet lightly with just 1 tablespoon of oil. Lift up the skillet by the handle and swirl to coat the bottom of the pan completely. Add the dough to the hot skillet and carefully stretch it to go halfway up the sides. 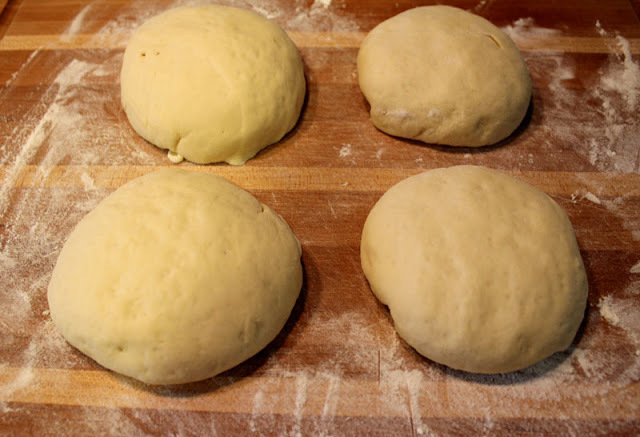 Press your fingers into the dough to make small indents. Sprinkle with the remaining 2 tablespoons olive oil, the red onions and rosemary. Top with the freshly grated Parmesan. Bake on the middle rack until lightly golden brown, about 35 minutes. Slice into wedges and serve. Posted on February 12, 2014 at 3:02 pm. I am planning a pizza party for 14 people. That is a lot of pizzas to make. The idea is to set out toppings on the kitchen island and let everyone choose their own. The biggest obstacle to pulling this off is the pizza dough. It makes such a mess and frankly I don’t think I have the space for everyone to flour boards and stretch their own. Thanks to my Daughter-in-Law Kristen, I have come up with a solution. 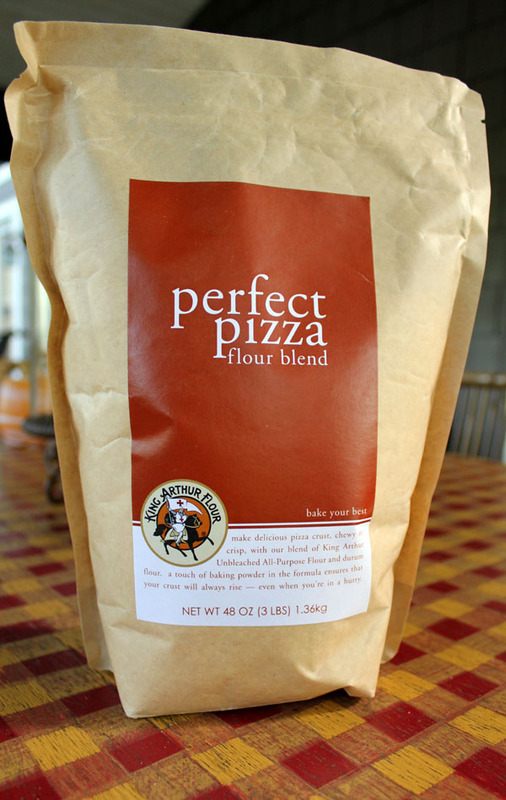 I start out with Perfect Pizza Flour Blend from King Arthur Flour. This is such an easy dough to manage when you are forming your pizzas. 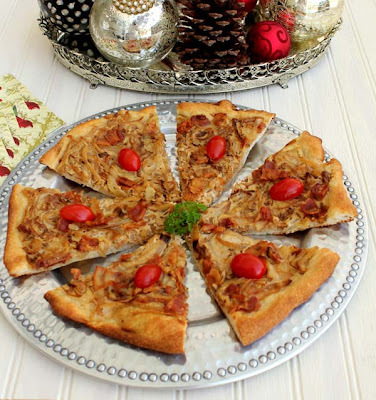 It is a blend of golden durum wheat and unbleached flour with an all-natural dough conditioner and baking powder added for an extra-light crisp crust. I make my pizza dough in my bread machine. It is so easy. 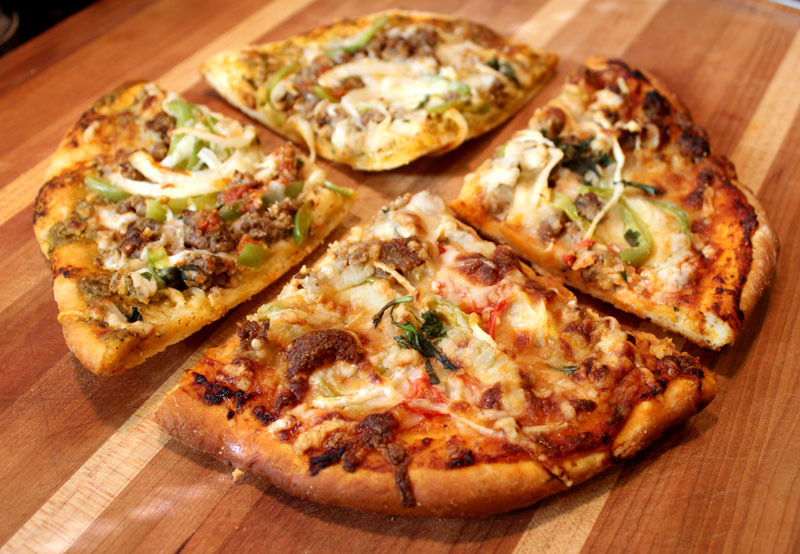 Four cups of the pizza flour yields four dough balls for 10-inch individual pizzas. I pull and stretch the dough on a cornmeal dusted paddle. Now, this is what Kristen taught me that is so valuable. Before she tops her pizza with ingredients, she brushes olive oil on the dough and sprinkles it with salt, pepper and Parmesan cheese. 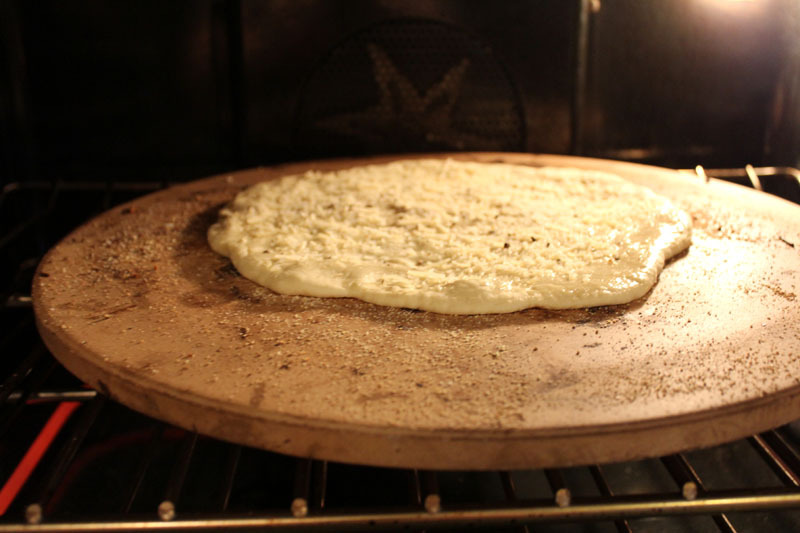 The dough is placed on a pizza stone in a 475 degree oven and prebaked for about 5 minutes. We now have a crust that will be easy to top and for me that means I can make all of the crusts ahead of time and place them in the freezer until I need them. On the day of the party, all I have to do is defrost the crusts and assemble the topping ingredients and everyone will be able to build their own pizzas. Of course we had to test the pizzas to see if they were good. the two on the right have marinara sauce, mozzarella, sausage, peppers, onions and Parmesan. The two on the left have the same ingredients, but with pesto sauce instead of the marinara. Kristen likes to add the mozzarella after the sauce, then the other toppings, then more mozzarella and Parmesan. She learned that from my Son, who worked in a pizza restaurant while in high school. She also likes to finish her pizzas with a fresh note like a squeeze of lemon juice or fresh basil. Thanks Kristen. Place all of the ingredients into a bread machine. Set on dough or pizza setting. Process until done. On a floured board, knead dough briefly and cut into 4 pieces. Roll each into a ball. Cover with a cloth and let rest for about 15 minutes. 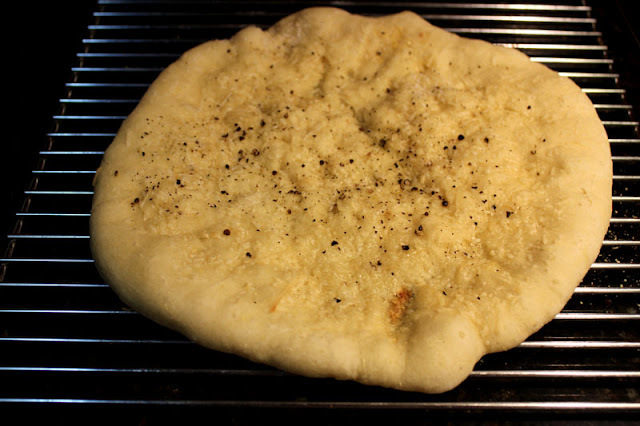 Dust a pizza paddle with cornmeal. Stretch one of the balls into a 10-inch (approx.) circle. Brush with olive oil and sprinkle with Parmesan cheese and salt and pepper. Slide pizza circle onto a pizza stone in a 475-degree oven. Bake for about 5 minutes. Remove to a rack. Proceed with remainder of the dough balls. When all of them are cooked and cooled. wrap in foil and place in plastic bags. Freeze until needed. Allow pizza rounds to thaw to room temperature. 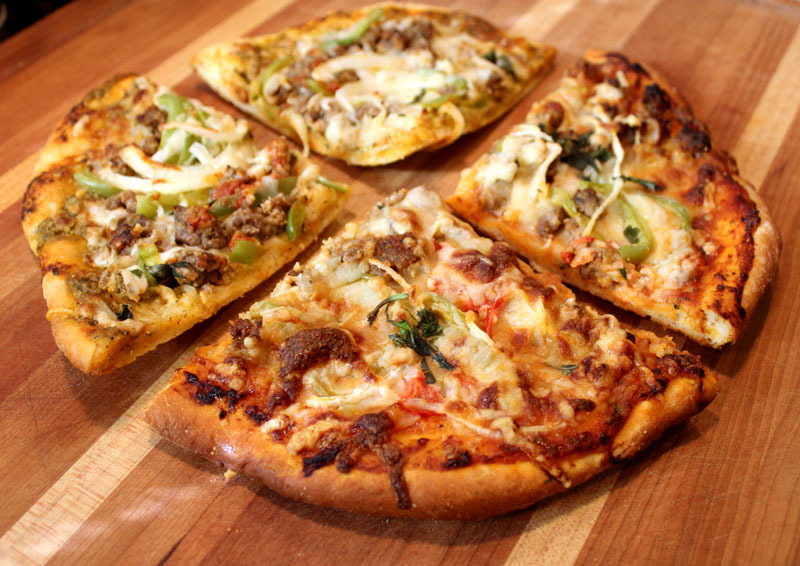 Place your toppings of choice on pizza rounds and bake until browned and bubbly. Posted on July 27, 2012 at 9:25 am. This is a recipe that has been in my folder for a long time. Unfortunately I did not write down the source. I have found that it is a great recipe for a simple supper after Christmas shopping or on an appetizer table for the holidays. You can make your own pizza crust or if you need one quickly, you can buy one of the crusts in a tube. I love the sauteed onions and bacon on it. Instead of a tomato sauce and cheeses it has a custard made from sour cream and an egg. It is subtly seasoned with nutmeg and caraway seeds. Perfect for this time of year. Preheat oven to 375 degrees. F. Saute bacon in heavy large skillet over medium-high heat until crisp. Remove to paper towels to drain. Remove all but 1 tablespoon bacon drippings from skillet. Add onions and saute over medium heat until onions are very tender, about 20 minutes. Cool. Whisk egg, sour cream, salt, pepper, and nutmeg in large bowl to blend. Stir in cooled onion mixture and most of bacon. 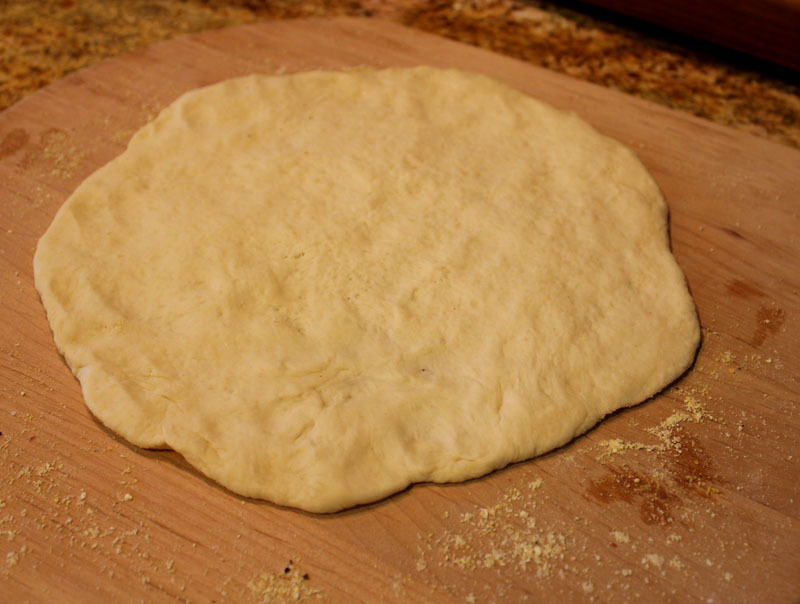 Roll pizza dough out on lightly floured surface to 13 x 10 inch rectangle or into a circle to fit pizza pan. Transfer dough to baking sheet. Spread onion mixture over dough, leaving 1/2 inch plain border around edges. Add remaining bacon and sprinkle with carasay seeds. Bake tart until onion custard is set and crust is golden brown around edges and brown on bottom, about 25 minutes. There is still time to vote in the eRecipeCards contest. I am currently in 3rd place and I could really use your vote. Just go over to the website and register. Then go to the home page and follow the links to the O Olive Oil Contest. Thanks everybody. Posted on December 5, 2011 at 2:48 pm. Sometimes it is hard to be a food blogger. There are days when meals are easy everyday food that no one would be interested in hearing about. I have been going through a period like that lately. We have eaten lots of homemade soup, but they are soups I have talked about before. I did make a wonderful chicken noodle soup the other night with twice the celery and carrots that I normally put in it and half the noodles; very good and good for us. But Friday night, before we went to a concert, I made a quick meal of these pizzas that were in a Weight Watcher’s cookbook. I’m not sure what it was about them, but they were a hit. It might have been the artichoke hearts, the roasted red peppers or the balsamic vinegar, but we both loved them. I added a bit of bacon to the recipe because I love bacon in pizzas. The dressed lettuce is placed on the tortillas and heated briefly in the oven to warm everything and slightly wilt the lettuce. David even said that this would be good on Sunday nights when we normally have real pizza. I agree. Give these a try for a quick supper or lunch. Meanwhile, toss together the lettuce, tomato, artichoke hearts, beans, roasted pepper, vinegar, oil, and black pepper in a medium bowl. Arrange the tortillas on a baking sheet. Top each tortilla with about 1 1/4 cups of the salad (I think I used a little less) and sprinkle with some of the cooked bacon and 2 tablespoons of the mozzarella. Bake until the cheese melts and the lettuce wilts slightly, about 5 minutes. As an aside, while walking today I saw flocks and flocks of birds heading South. I understand that Florida is the only state in the SE without snow today. I think the birds are heading for the Bahamas. I would be too if I could. Stay warm. Posted on January 11, 2011 at 5:47 pm.